Our Assessment Products – Great Lakes Profiles Inc.
Get a clear picture of candidate’s thinking style, behaviors, and interests, giving you a meaningful edge in making the right hiring decision. Start the selection process on the right foot. Explore an expanding library of job functions to which you can compare candidates. Interview with confidence! Ask tailored questions and keep an open ear for “what to listen for” based on a candidate’s assessment results. Identify ways to enhance performance and maximize an individual’s contribution to an organization. Match people with positions in which they’ll perform well and enjoy what they do. Reduce turnover and boost employee engagement which results in happier employees! Comprehensive Selection Report – Is the candidate a good fit? This powerful report helps you make smarter hiring decisions with confidence. Featuring tailored interview questions and tips on “what to listen for” with each candidate, this report gives you a meaningful edge in your hiring process. Multiple Positions Report – Which positions might be best for a particular individual? Compare a candidate or employee to multiple jobs in your organization. Multiple Candidates Report – Make hiring decisions with ease. Compare multiple candidates for a single position. Performance Model Report – Understand the range of scores and behaviors for the position you’re trying to fill. Learn about the ideal candidate for that role. Individual’s Feedback Report – Candidates can learn from PXT Select as well. This narrative report doesn’t reveal scores and is perfectly safe to share with applicants. Individual’s Graph – Are you more of a visual person? The graph illustrates a candidate’s results that you can view at a glance. Coaching Report – Wish you had coaching advice tailored to each employee? This report gives you exactly that and more. • Genos EI Selection Report – is a measure of how a job candidate demonstrates EI across seven key EI competencies and it allows hiring managers to utilize those measurements to make the best possible hiring decisions. Each section contains open-ended behavioral based interview questions plus an interview evaluation guide. The summary section helps the interviewer combine the assessment and interview results in an objective manner. We recommend clients use the Genos EI Selection Report in conjunction with our PXT Select assessment which predicts job fit suitability. • Genos EI Workplace Behavior Self Report – measures how efficiently a person believes they exhibit EI in the workplace as well as their beliefs on the importance of EI. • Genos 180° EI Workplace Behavior Feedback Report – displays how efficiently an individual exhibits EI in the workplace as reported by colleagues (including subjective comments from raters) and it compares those measurements to those of the self. • Genos 360° EI Workplace Behavior Feedback Report – details how well individuals exhibit EI in the workplace and how that behavior is important to their boss, peers, and others (including comments from raters) and it compares those measurements to those of the self. 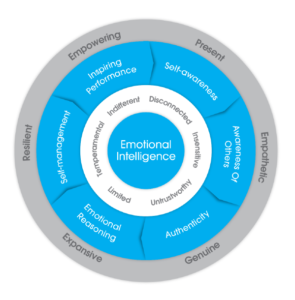 • Genos EI Leadership Self Report – measures how efficiently new supervisors believe they exhibit EI in the workplace as well as their beliefs on the importance of EI. Development tips are provided with each category assessment. • Genos 180° EI Leadership Feedback Report – displays how efficiently supervisors and managers exhibit EI in the workplace as reported by workplace colleagues (including subjective comments from raters) and it compares those measurements to those of the self. Development tips are provided with each category assessment. • Genos 360° EI Leadership Feedback Report – details how well an established leader exhibits EI in the workplace and how that behavior is important to their boss, peers, direct reports, and others (including comments from raters) and it compares those measurements to those of the self. Development tips are provided with each category assessment. A unique feature is when five or more direct reports have participated in the assessment an Employee Engagement Survey can be activated. The SOSII is a brief pre-hire assessment that measures an individual’s basic work-related values. It’s used primarily as a screening tool early in the candidate selection process. This assessment provides valid insight into an applicant’s work ethic, reliability, integrity, propensity for substance abuse, and attitudes toward theft — including property, data, and time. The CheckPoint Management System is a 360-degree assessment. It’s used primarily to evaluate the effectiveness of your managers and leaders, and helps them identify and prioritize their own development opportunities. Profiles Sales CheckPoint™ is a 180-degree feedback system that helps sales managers evaluate sales people, surface their development needs, and align sales priorities in order to improve sales performance. It provides useful information to support better coaching and communication, leading to higher sales person productivity and satisfaction, and lower turnover. The Profiles Sales Assessment™ (PSA) measures how well a person fits specific sales jobs in your organization. It’s used primarily for selecting, onboarding, and managing sales people, and account managers. The job modeling feature of the PSA is unique and can be customized by company, sales position, department, manager, geography, or any combination of these factors.